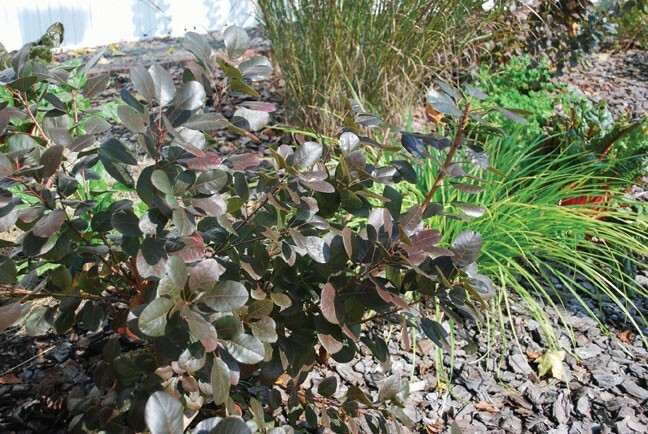 Cut back a purple smokebush hard in early spring to ensure deepest foliage color. If a shrub is trying to eat your house, now is the time to take action. So you put a forsythia in a little garden bed, and now it’s the size of a minivan? We won’t judge you, because we’ve all done it. If your deciduous shrub is hopelessly overgrown, with limbs all a-tangle, it may be time to do a hard pruning. What do you have to lose? It looks terrible now. 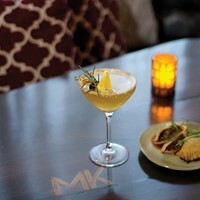 In the Hudson Valley, late March and early April, before the shrub’s buds “break,” is the time to do this. Right now in late winter/very early spring, a deciduous shrub’s root system is stocked up on food (carbohydrates yielded by photosynthesis). That stored energy is available to send up a bunch of vibrant new shoots after you cut the shrub back hard. Some shrubs love this treatment, others tolerate it but are slow to rebound, and others will just not come back. You have to consider each species of shrub individually. 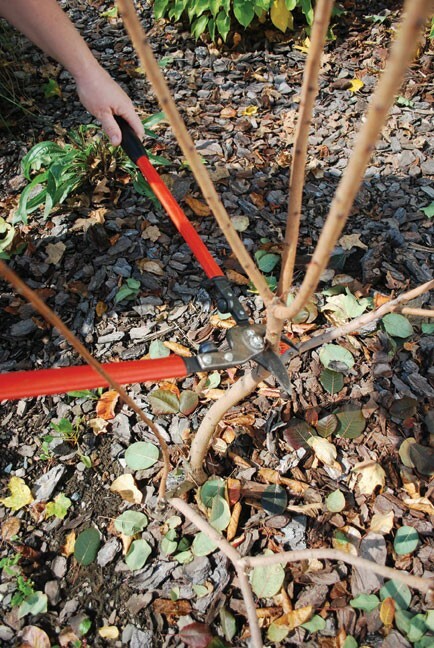 Look up what to do in a fine resource like The American Horticultural Society’s manual Pruning & Training. Also, depending on whether the kind of shrub in question blooms on “old wood” (last year’s buds) or “new wood” (buds formed on this year’s growth), you may lose flowers this year. But chances are, if the shrub is this far overgrown, most of the flowers have become relegated to the tippy top only, and it’s worth one year’s sacrifice to get the plant back into bounds, looking more compact and shapely, and flowering more prolifically. I teach a shrub pruning class to lifetime learners in the spring, and last year we gave a pair of mock orange shrubs “the business.” They are about 20 years old, in a bed about eight feet from the driveway, and had never been pruned. Winter winds had over time caused a massive branch “combover” to the leeward side. Also, because the shrubs had so far outgrown their garden bed, the snowplow just creamed them on the driveway side. My intrepid students and I decided the best course of action was to hard prune these mock oranges, even though it would mean that, because mock orange sets flower buds on the previous year’s wood, flower show that spring would be almost nil. We brought the shrubs down from about 12 feet to four feet and pulled out any dead canes, or shrub stems. We ended up with a low scaffold of a dozen stems or so. The students, while having enjoyed their pruning tear, looked concerned. Had we gone too far? Would they really rebound? “Not to fear!” I reassured them. Six weeks later, the shrubs had filled back in beautifully, abundantly, and, indeed, needing some further pruning of the vigorous new growth to coax a nice compact shape. It helped that the mock oranges are growing on fantastically fertile former cow pasture, and that the spring had brought lots of rain that assisted the shrubs in their regrowth. It wasn’t assured, but it was a good bet. Initial regrowth on purple smokebush after hard pruning. 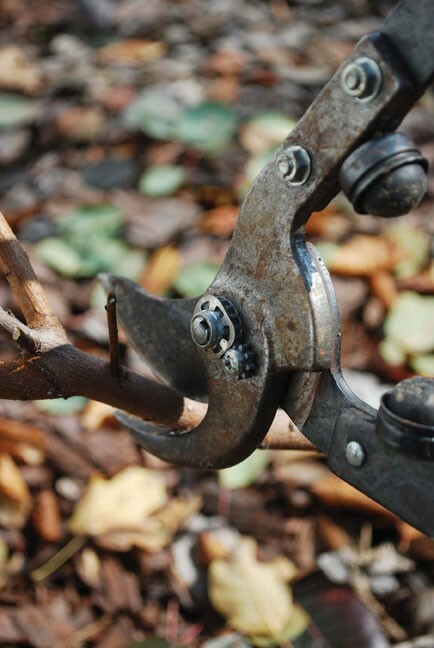 Hard pruning can bring tangled messes of shrubs back to shapeliness, but it can be risky. For instance, most evergreen shrubs don’t rebound once you cut into older wood. Some evergreens, like boxwood, may rebound if they’re healthy and get good aftercare, but ever so slowly, and they will look rather pathetic the first couple of years. I’ve seen hard-pruned rhododendrons come back resplendently within three years, and others not come back at all. Yews will normally rebound just fine, but in the case of my friend Maria’s house, where the yews have reached Miss Havishamian proportions, I’d be afraid to cut such massive plants back so hard. It would remove so much aboveground biomass, I’m not confident the below-ground biomass would be enough to support vigorous regrowth. Some shrubs are subshrubs in our area—that is, their root systems are winter hardy but their aboveground parts are not. Butterfly bush is a subshrub in the Hudson Valley, so you’ll notice its stems mostly dying back every winter, but new growth emerges from very low down on the canes. This can also happen with many types of ball-flowered hydrangea shrubs. When in doubt about how far to cut subshrubs, wait for a hint of bud expansion to occur, and in this way the plant will tell you how far down to cut (just above the first viable buds). Below is a list of some shrubs that are nearly foolproof for the hard-pruning technique, given that the plant is in good health to begin with (e.g., not diseased or stressed by poor growing conditions), and given that you prune in late winter or early spring. Get out those loppers and cut these shrubs back hard—to a foot or two—now, before bud break. Water them during any dry spells in the springtime. Then, in early summer, shape the new growth by heading stems back as they grow. Continue to water if the summer doesn’t provide at least an inch a week of rain. Some shrubs are hard pruned annually (or nearly so) to ensure that the resultant regrowth (basically, suckers) has the most vibrant stem color or foliage. For instance, red-twig dogwoods are reddest on the newest stems, so to get the brightest winter color, cut them back most years. I cut back my purple smokebushes annually because I want the deepest, richest purple foliage—and I’m willing to sacrifice the wispy flowers to get it. I also like the way the yearly hard pruning keeps them more compact. If not pruned, they tend to get leggy and have lengths of stem that are bare of foliage.